What is Colon Hydrotherapy Benefits of Colon Hydrotherapy Colon Hydrotherapy can restore optimum health Why consider Colonhydrotherapy What should I expect ? Prepare for your session to maximize results. Frequency of treatments. Expert advice about Colonics. Far too many people are uneducated about colon health and even fewer understand the benefits of Colon Hydrotherapy. There are many things that you need to know in order to keep your body in good health. There are the obvious things like eating healthy and regular exercise. Then there is the topic of colon health, which is one of those topics that people try to avoid, but shouldn't. The colon is undoubtedly the most important organ in the body. Many illnesses and symptoms can be linked to the colon yet most people tend to ignore its existance. This site is designed to help educate people about colon health in general. Colon Hydrotherapy, and the benefits of internal cleansing and detoxification. Hopefully the information provided here will motivate people who have otherwise ignored their own colon health, to make a positive change. I recommend reading all of the information on this site and even doing some of your own research, to decide if Colon Hydrotherapy is for you. There are some people with specific diseases or conditions that are contraindicated and should not use colon hydrotherapy. Water holds a major place in nature's cycle. Life and the reproduction of any species cannot exist without water. Without water, we will only live a few days.This is because our body relies on water to filter, move, and get rid of toxic or foreign particles that can get into our system. Our bodies are made of 80% water and 20% mass.The brain itself is 93% water. What happens when we don't get enough water? Our bodies slowly dehydrate and we become sluggish, forgetful, unable to do basic math, and very fatigued. Now lets talk about clean, pure, water. Water can be found in many places. But water is a carrier. That means that when water, H2O, is mixed with something else, it becomes what is added. For example: a glass of water with a lemon slice in it becomes lemon-water. That means as your body ingests and starts to assimilate it, it treats the lemon water as it does a lemon. This is also true at mealtimes. When you consume water with your meal, the water becomes what the meal is to your body. What have we learned? In order for your body to assimilate water, it must have nothing mixed to the water or nothing can be in your stomach (which means 22 minutes before or after a meal or snack) in order for your body to assimilate water as water. 1. 75% of Americans are chronically dehydrated. (This applies to half of the worlds population. 3. Even MILD dehydration will slow down ones metabolism as much as 3%. 4. One glass of water will shut down midnight hunger pains for 100% of the dieters studies in a university of Washington Study. 5. The number 1 trigger of daytime fatigue is lack of water. 6. Resaerch indicates that 8-10 glasses of water a day could significantly ease back pain and joint pain for up to 80% sufferers. 7. A mere 2% drop in the body water can trigger fuzzy short-term memory, trouble with basic math, and difficulty focusing on computer screen or on a printed page. 8. 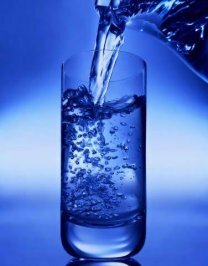 Drinking 5 glasses of water daily decreases the risk of colon cancer by 45%, slash the risk of breast cancer by 79%, and one is 50% less likely to develop bladder cancer. IF YOU ARE NOT DRINKING A GALLON OF WATER A DAY, YOU ARE NOT DRINKING ENOUGH WATER!